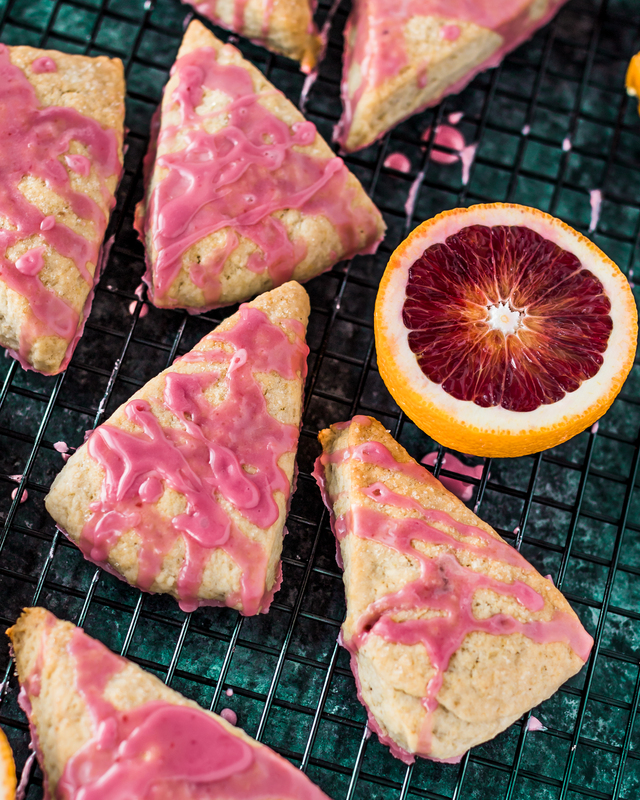 Blood Orange Coconut Scones | Eat. Love. Namaste. What makes the perfect scone? The perfect scone is one that is flaky, warm, soft, and topped with a thick layer of sweet glaze. 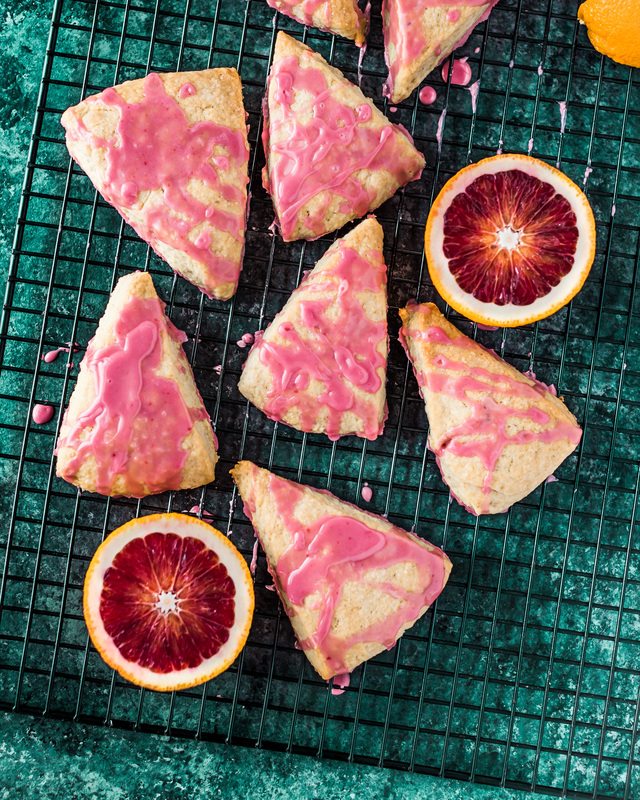 If you agree and you love blood oranges, then you are going to love this scone. This recipe is simple and requires 30-minutes and only 10-ingredients! The staple ingredient that always results in a flaky and moist scone is using coconut oil instead of butter. The coconut oil leaves a subtle hint of coconut flavor, which compliments the blood orange nicely. As mentioned, my perfect scone is one that has a thick layer of sweet glaze. The glaze requires 2 ingredients: freshly squeezed blood orange juice and powdered sugar. It’s optional but highly recommended. If opting out on using the glaze or want to add fruit, raspberries pair lovely with the blood oranges. Either following this recipe or change it up to your liking, I think you are going to love this scone! These scones are beautiful looking, healthier than the original, flaky on the outside, moist on the inside, and ultimately delicious! 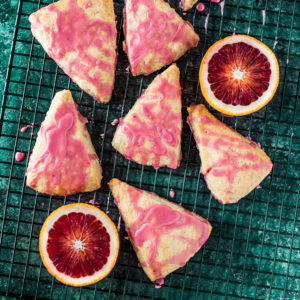 30-minute Blood Orange Coconut Scones made with coconut oil and layered with a beautiful sweet blood orange glaze. Preheat oven to 400 degrees Fahrenheit and line a baking sheet with parchment paper. In a small mixing bowl, whisk the flax seed with the water (to make the flax egg) and set aside for 3 minutes. In a separate mixing bowl, add room temperature coconut oil, nut milk, cane sugar, and the blood orange juice. Whisk together, then whisk in the flax-egg. Mix the flour, baking powder, and salt in a separate bowl. Then add to the wet ingredients a little at a time while stirring with a spatula, or wooden spoon. (If adding raspberries, add now by gently stirring in to incorporate). Gently transfer the mixture to a floured surface and use your hands to form it into a disc, about 1 inch in height. Cut the circle into 8 for wedges and use a floured spatula to transfer the scones to the prepared baking sheet. Sprinkle the tops with a bit more cane sugar and bake for 25 minutes, or until lightly golden brown on the edges. Remove the scones from the oven to cool. 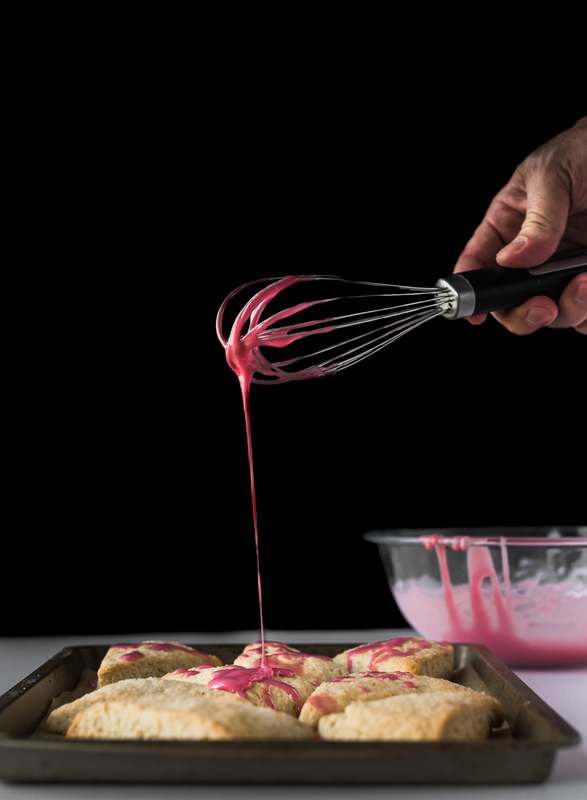 While the scones are cooling, prepare the glaze by whisking the powdered sugar with blood orange juice. Drizzle the glaze on top of the cooled scones before enjoying. Best when fresh; store leftovers at room temperature in a well-sealed container for up to 3 days. Hi, I'm Tracey & welcome to Eat. Love. Namaste. Here you will find healthy recipes made from wholesome ingredients ♥ advice & tips for loving yourself and others ♥ inspiration for staying fit!